nlog is free logging platform which use in .net, mobile platform. 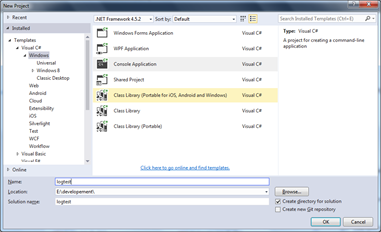 Its very easy to use and integrated with Visual studio Nuget package manager. 1. Creating console application to check how to use nLog. 2. 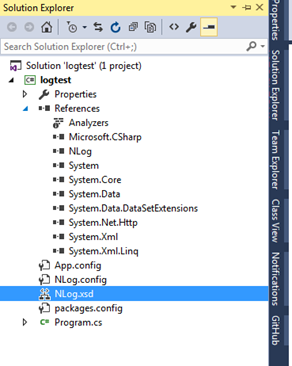 Now add the nlog from Nuget package. Add both nlog and nlog Configuration file. 3. Now you can see that it added the Nlog dll in reference and Nlog config file. 4. Let’s see the configurations. 5. You need only below namespace for configuration. Others you can remove. Source will use to identify in Event log. There are many log type listed. Lets select the event log. 7. You can set the rules for which condition log will happens. Now it will log when ever we have error, Info, warn, debug. 8. Let’s move to the coding side. b. Create an Variable for logger class. c. Lets create two method one for logging the debug information and another for Error log. You can see the full code of log. d. Call the method from program class. 9. Now run the application. 10. 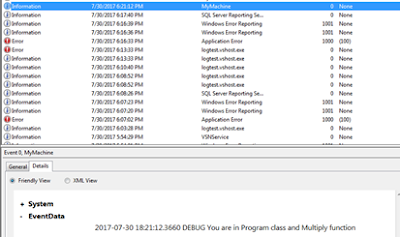 See in the Event viewer, open the event viewer. You can see below that two records are logged for source MyMachine. One is information another is error. Click on information you will see message like below which ever you passed. 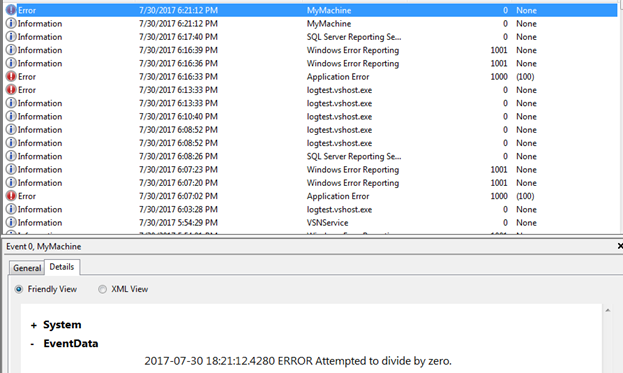 Click on error you will see the error you got from your application.